European aerospace giant Airbus has quietly lifted the curtain on an ambitious Silicon Valley project called Vahana. 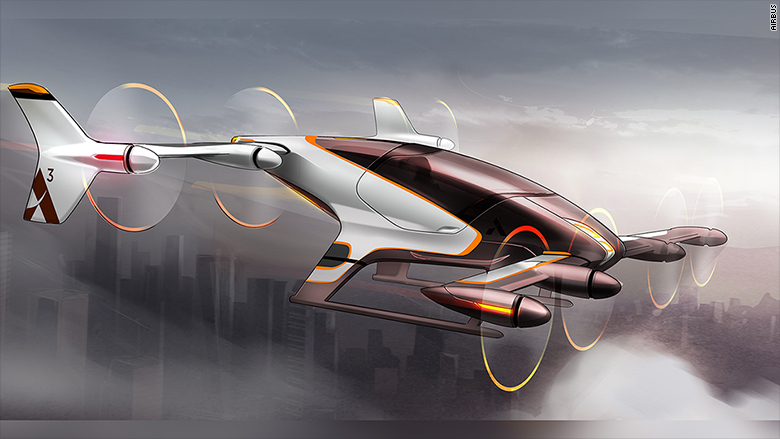 It's a pilotless passenger aircraft that aims to someday add a vertical component to your commute. 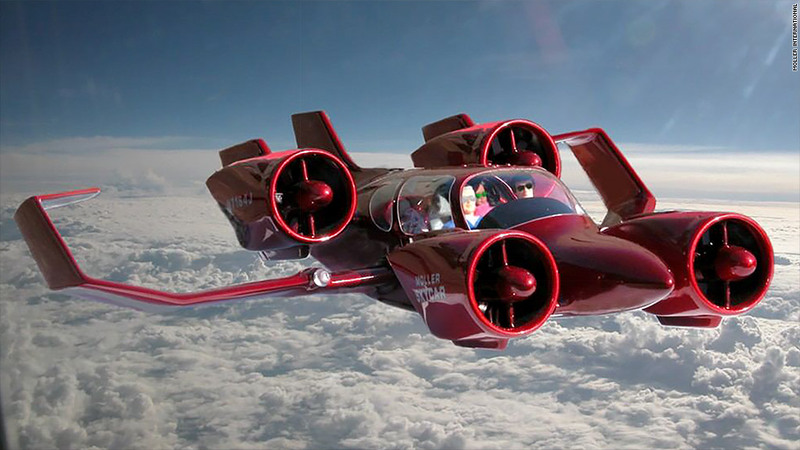 Think of Uber-like air taxis that can beat the traffic on Highway 101 by flying over it. Airbus has shared few details about the aircraft, but recently posted its first conceptual renderings on a Medium blog. The drawings depict a craft that can take off and land vertically. It has helicopter-like struts, and two sets of tilting wings each with four electric motors. 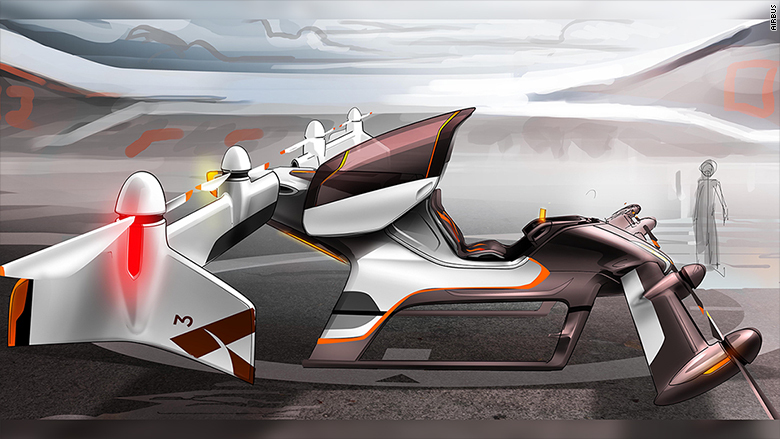 There's room for a passenger under a canopy that retracts like a motorcycle helmet visor. Airbus, a rival of American icon Boeing (BA), is best known for its large jetliners like the double-decker A380. But it's also pouring big money into the future, and holds an advantage that many aviation startups with radical concepts don't have: Experience and funding. The project hopes to fly a full-size prototype by the end of 2017 and eventually have something it can sell by 2020, Lyasoff wrote. For sure, commercial or passenger use of such a machine faces significant hurdles, including a lack of established standards for electric planes and any aircraft that doesn't have pilots. Airbus isn't the only manufacturing industry pillar to explore new areas of mobility. Car-makers Toyota and Honda have sought to expand into aviation. Honda delivered its first private jet in 2015 after three decades developing new aerospace technology. Airbus is trying to tap into a nascent, but fast-growing, field: the use of battery-powered electric propulsion technology to enable on-demand services. In this case, the vision is for air taxis that use "urban airways in a predictable and controlled manner," wrote Lyasoff. Airbus announced last year that one of the first A3 projects would be a collaboration with Uber to prove a new business model for helicopter operators. NASA, too, is investing heavily in researching electric propulsion and plans to fly its own design, the X-57, in 2018. Of course, flying taxis that don't have pilots pose some tricky safety issues. Airbus says that "sense and avoid" technology will be used to prevent midair collisions, and a ballistic parachute would deploy if a craft's engines malfunction. Airbus has intentionally separated A3 from the rest of its manufacturing operations in Europe, China and the U.S. Unlike its buttoned-up parent, A3 has hallmarks of a Silicon Valley startup: It has a recruiting profile on its website for "Jane Jackalope" -- a job listing for an executive who is a "jackalope of all trades."